Are you still learning the ropes of rainwater harvesting? Are there only a few people living in your home? Then buy this 1200-litre slimline lowline water tank and have it installed in your property! With a 620mm width, a 2000mm length, and 1200mm height, you need not worry about extra space in your property, as it can easily fit in almost any section perfect for use in the collection and storing of rainwater. 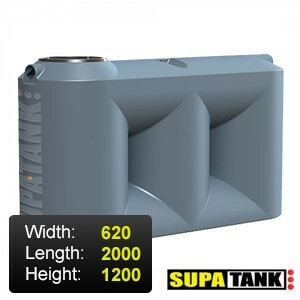 This tank is not only known for its slim and short profile, it is also known for being made using non-toxic, food-grade, and high-quality plastic. Not only that, its creation is carefully supervised to ensure that it is made under the highest quality standards. These are what make the tank capable of keeping safe any water stored in it for a very long time. The same reasons above are also why the tank does not deteriorate and look ugly in your property even after several years of being there, collecting rainwater for you. The benefits of rainwater harvesting are countless. The most obvious benefit is being able to use clean and safe drinking water free of charge. The second benefit of the practice is having access to water even if a shortage was happening. Other benefits of the practice include flooding and soil erosion prevention, the replenishing of groundwater, and water shortage prevention. However, to truly benefit from the practice, you need to have the best components possible. So if it is a tank you need, get one from us today. You can reach our experts through an email form in the Contact Us portion of the site. Another option is to leave your contact information through the form in this page, accessible by clicking the button below the tank dimensions.